According to anonymous sources, Infinite has scrapped two multiplayer modes during the course of its development. Despite looking as gorgeous as it does, BioShock Infinite's recent reported history has been mired in wobbles and gaps. In an interview with gaming site Kotaku, Ken Levine, lead developer at BioShock studio Irrational Games, has now gone on the record to say that Infinite is "on track" for release in early 2013, reminding the world at large that blips and trips are commonplace in projects that are as "challenging" as this one. Questions remain, however, over the possible existence of a multiplayer mode in the game. According to "sources close to the matter" who spoke to Kotaku, Infinite did indeed possess two nascent multiplayer modes until fairly recently. However, both were dropped following design decisions that the sources didn't describe in any particular detail. They did reveal, however, that the two scrapped modes comprised of one arcade-style tower defense game, and one "Spec Ops-style" co-op mode. None of this means, of course, that there aren't different, undisclosed multiplayer modes hiding in Infinite's future. For his part, Levine wouldn't comment on the multiplayer aspect beyond saying, "As I've always said we are experimenting with things, and only if they are good enough will we put them in the game." 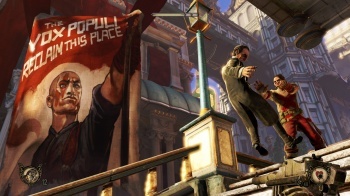 Levine concluded by addressing worries some fans have expressed over the future of BioShock Infinite, taking the opportunity to assuage community worries about some of the slightly troublesome news that has appeared during the game's development. "When you are trying to innovate," he said, "the path is not always clear and these things take time. But I guarantee this: The next time we show you guys the game the judge will be you, not me." Here's to hoping that truer words were never spoken.